Unicorn or Unicorn Dreams comes in the Thermal Tote, the Cinch Sac, the Large Utility Tote, the Littles Carry-All Caddy, the Cool Zip Snacker, and the Essential Storage Tote. 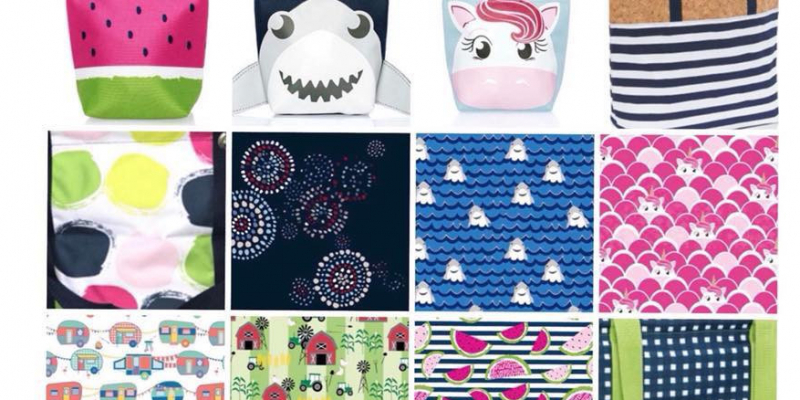 Shark or Shark Party comes in the Thermal Tote, the Cinch Sac, the Large Utility Tote, the Littles Carry-All Caddy, the Cool Zip Snacker, and the Essential Storage Tote. Watermelon comes in the Cool Zip snacker. Sweet Sparklers comes in the Picnic Thermal Tote, the Large Utility Tote, the Littles Carry-All Caddy, and the Essential Storage Tote. Farm Fun comes in the Picnic Thermal Tote, the Cinch Sac, the Large Utility Tote, the Littles Carry-All Caddy, and the Essential Storage Tote. Goin' Gingham comes in the Crossbody Thermal Tote, and the Large Utility Tote. On the Spot comes in the Bring-A-Bottle Thermal, the Crossbody Thermal Tote, the Large Utility Tote, and the Mesh Mix Cinch Bag. Fun N Games comes in the Game On Set. Slice of Summer comes in the Cool Cinch Thermal, the In the Clear Tote and Zipper Pouch, the Mini Zipper Pouch, the Pinch Top Eyeglass Case, and the Summer Fun Caddy. Cabana Stripe comes in the Getaway Tote.